Tony Calabro Illustration: Corporations are people too! This is a piece I recently did inspired by a Rush Limbaugh rant. Limbaugh was going off because of the new The Dark Knight Rises movie. 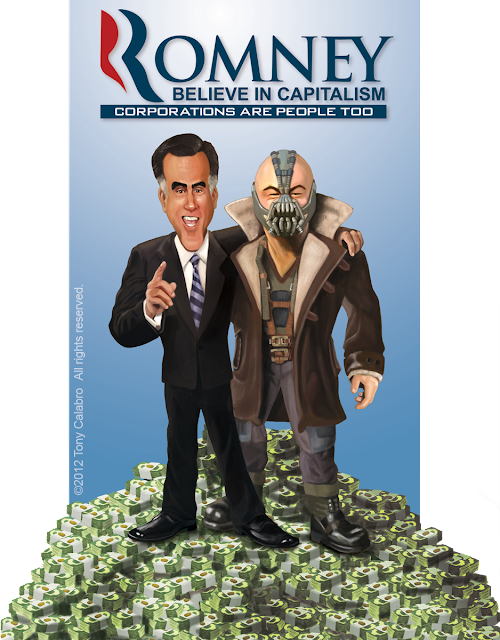 He believes that the villain of the movie, Bane, is actually a liberal conspiracy to connect Mitt Romney and Bain Capital to the evil mastermind antagonist of the heroic Batman (Obama in Rush's argument). He went on to say all the brain dead liberals will go see this movie and be compelled to dislike Mitt Romney. His argument is beyond ridiculous for many obvious reasons, so I decided to do this piece and illustrate what he believes everyone who sees this movie will be brainwashed into believing. That is if they didn't believe it already.